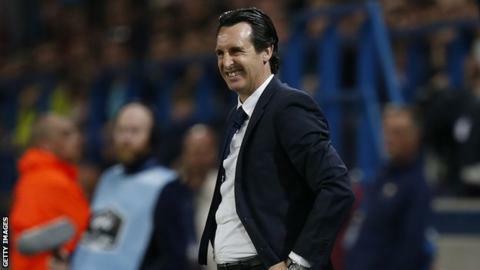 Emery is only the second Arsenal manager to come from outside Britain, after Arsene WengerUnai Emery was the "unanimous" choice to "drive the next chapter" of Arsenal's history after being confirmed as the club's head coach, says chief executive Ivan Gazidis.Emery, 46, joins the Gunners having left French champions PSG after guiding them to the Ligue 1 title.The Spaniard also won four domestic cups with the French giants, having previously guided Sevilla to three successive Europa League triumphs. He succeeds Arsene Wenger at Arsenal.The Frenchman left the club at the end of last season after 22 years in charge. "Unai has an outstanding track record of success throughout his career, has developed some of the best young talent in Europe and plays an exciting, progressive style of football that fits Arsenal perfectly," Gazidis added. "His hard working and passionate approach and his sense of values on and off the pitch make him the ideal person to take us forward." What did Emery say[/IMG]"I am thrilled to be joining one of the great clubs in the game. Arsenal is known and loved throughout the world for its style of play, its commitment to young players, the fantastic stadium, the way the club is run. "I'm excited about what we can do together and I look forward to giving everyone who loves Arsenal some special moments and memories." Emery announced last month he would leave PSG when his contract expired at the end of the season, despite leading them to the Ligue 1 title.During his two-year spell with the French giants, he also won four domestic cups, having joined from Sevilla in 2016.It was in his home country that the former Real Sociedad and Toledo midfielder made his name as a manager, taking charge at Almeria and Valencia before moving to Sevilla in 2013.There he won three successive Europa League titles as well as finishing runners-up to Barcelona in the 2015-16 Copa del Rey. Emery's strengths lie in improving players and with a rebuilding job needed at Emirates following Arsenal's sixth-place finish in the Premier League, his meticulous, hands-on coaching may well be just what the Gunners need. French football writer Julien LaurensEmery will get Arsenal more organised than they have been. He's really keen on drills and discipline, worked PSG hard at training and has got a very good idea of what he wants to do.His first game at PSG was the 2016 Trophee des Champions - the French Community Shield - against Lyon and they won 4-1. PSG played with an intensity they never had before. It looked like his philosophy - pressing high, running a lot, attacking a lot, defending a lot, full backs bombing forward.But then the players said they should go back to what they know because they were used to tiki-taka football where they took their time.Emery had to evolve a bit to accommodate his players, when it shouldn't have been like that - it should've been the players accommodating his philosophy.If the Arsenal players are on board with what he wants to do, that's how he won three straight Europa Leagues, because that Sevilla team were all on board.